There's a reason Netflix's eerie original series The Haunting of Hill House earned so much buzz upon release: it's very, very good. The Mike Flanagan-crafted adaptation of Shirley Jackson's 1959 novel of the same name presents the Crain family in two timelines: the summer of 1992, as they move into the titular manor with hopes of flipping it into a financial windfall for themselves and all hell breaks loose, and the present day, when the five children are adults dealing with the lingering troubles of their past. Although the show is being celebrated for its multi-faceted messaging on the toll of loss and childhood trauma, it's also just plain fun and feels like an Easter egg extravaganza all the way through thanks to the many hidden details and references contained in the inaugural season. Here's a look at some of the bits and pieces of The Haunting of Hill House you might've missed during that initial binge watch. Beware the spoilers! Was that really a happy ending? 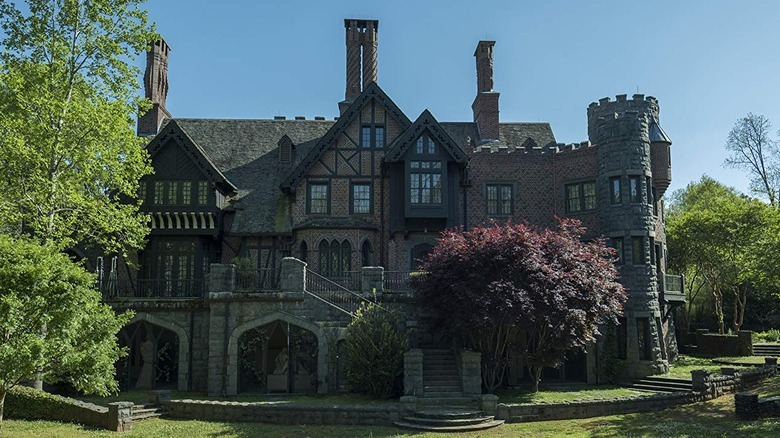 In the final moments of Hill House, we watch as Hugh Crain agrees to stay in the "Red Room" with the ghost of Olivia and Nell in exchange for letting their four living children return to the outside world, instructing them to be "kind" to one another after so many years of fractured relationships. 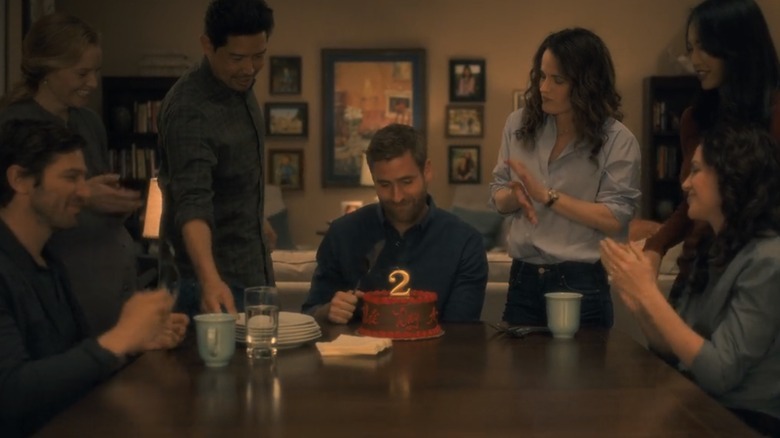 The group is then shown standing around a cake for Luke to commemorate his second year of sobriety, and all the others appear to finally be happy in their relationships with each other and their significant others. However, the actor portraying Luke, Oliver Jackson-Cohen, said the cast noticed something strange about the shot: the color of the cake. He explained to IndieWire that the color red appears in every scene involving the "Red Room," and when he noticed that his sobriety cake was iced with red frosting, it made him wonder whether this was a happy ending for the family after all. Others noticed Leigh's belly bump, and wondered whether that was another sign that the happy ending wasn't real, since we'd just seen Steven have a red room fever dream about the same. While Flanagan has since said he does consider their final moment of family joy to be real, he did consider ending things on a much darker note. As he told Thrillist, "we talked for a very, very long time about putting the Red Room window, that weird vertical window, in the background of this shot. And I ultimately decided not to. It was too cruel." 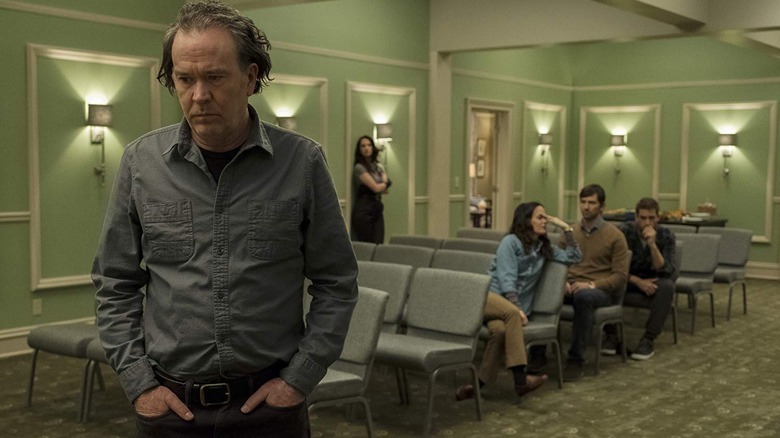 Each of the Crain siblings' individual struggles represent a different stage of grief: Steven is clearly in denial about everything that's happened to him and his family, Shirley's full of anger about her life, Theo's bargaining as she's willing to endure certain setbacks in favor of other gains, Luke is drowning in depression and uses drugs as an escape mechanism, and Nell comes to accept her fate and even embraces it when she returns to Hill House and takes her place alongside her dead mother. What's even spookier is that those characteristics are even in order of the characters' ages. Considering much of the narrative is about the five kids finally coming to terms with what happened to their mother, the play on psychological principles is clever and effective. Flanagan revealed that he made the choice early on to intermix the themes, telling Entertainment Weekly, "Grief is such a universal experience that when we were in the writers' room, every one of the writers at the table had their own perspective on it that came to bear with this, and that's something that jumped out immediately that yeah, when you talk about ghosts and you talk about what gothic horror can do, this is an incredible opportunity to really lean face first into some of the saddest and darkest things that we all deal with." The Haunting of Hill House has so many poltergeists floating around the title manor that over three dozen have already been spotted lurking — mostly in the background — and who knows how many remain to be discovered. The task might be a bit tricky, though, because Flanagan has admitted to making some sections of the house look like they contained spectral beings just to amp up the spookiness of the house. "When you read about the house in Jackson's book, it's so disorienting," he explained to EW. "We really wanted to try to take as many cues from that as we could [...] It was like, let's have a corridor that's all stone like a convent, and when we turn the corner let's go into something more baroque, and that was this reaction to the schizophrenia that we saw in the exterior. The other thing we did with the interior to help make it feel like something is off is that we tried to use design elements that look like human faces everywhere we could, in the wallpaper, in the light fixtures, and in the doorknobs." 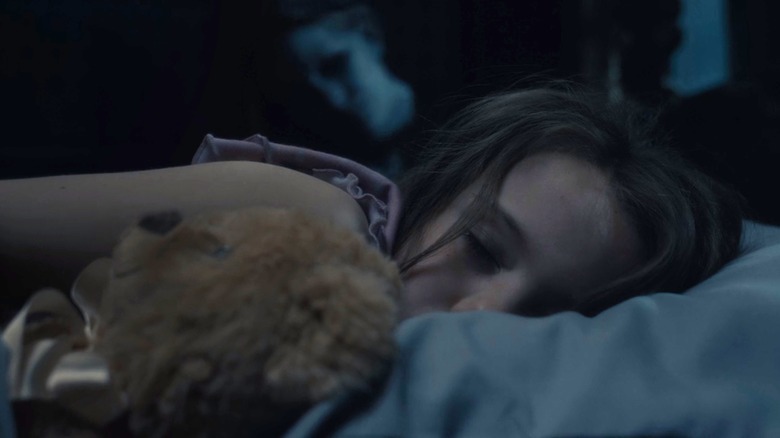 If it felt like there were more even scenes with ghosts than have been found, it's because the atmosphere was designed to keep everyone creeped. It's really too bad that Flanagan was unable to bring more of the Hill family history to light, because he clearly had a lot more to say about the group of ghosts who occupied the residence first — and continue to do so, in a sense. The ones we do see create a subplot of family drama: William Hill is the floating man with who haunts Luke for stealing his bowler hat and was driven mad in his lifetime; Poppy was his wife who was also clinically insane and convinces Olivia that her children need to die in the house to live; Hazel is the old woman in the bed who doesn't trust her new sister-in-law Poppy even in the afterlife; and the wheelchair-bound boy is one of the Hill children who bangs on doors to signal for assistance since he can't speak. If it felt like their story was unfinished by these appearances and the little asides about the house's history, that's because there were supposed to be a lot more of them. "We had a whole history of Hill House that we were going to shoot," Flanagan told Thrillist. "We were going to open several episodes of the show with this kind of history, split out over the whole season [...] And it was just one of those things where we were running out of time and resources, and something had to go." Among all the symbolism contained in the series, alert viewers pinpointed the significance of the number seven. 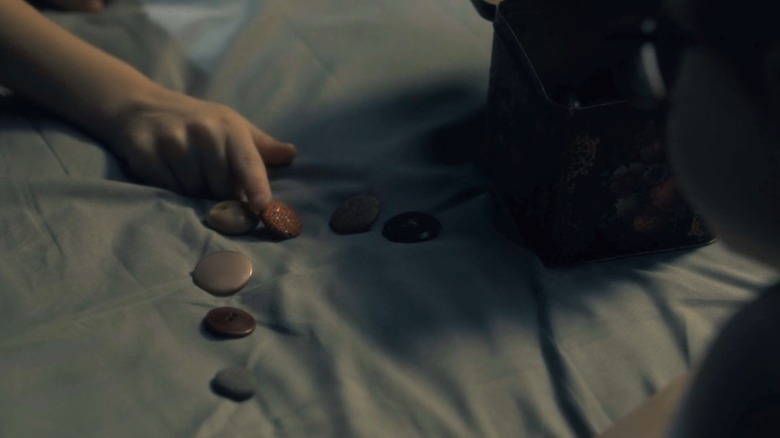 In an early scene, Luke shows Nell his self-protection ritual of tapping stones and counting to seven, saying, "It has to be seven… that keeps you safe. Sometimes you gotta do it a lot. Like, a lot a lot." The twins' beds just so happen to be seven steps apart from one another, and there are also seven members of the Crain family… until things go south, of course. The loss of Olivia turns the Crain family into a gathering of six, after which their lives remain in ruins. After Nell's death, Shirley points out the number issue again when she says, "There were seven of us, and now there's five, because two of us decided to die." However, the final shot of the series shows the four remaining Crain children gathered alongside their spouses — of which there are three, as Luke is still single — and since they once again form a group of seven, they're the perfect group to stay safe by his childhood standards. 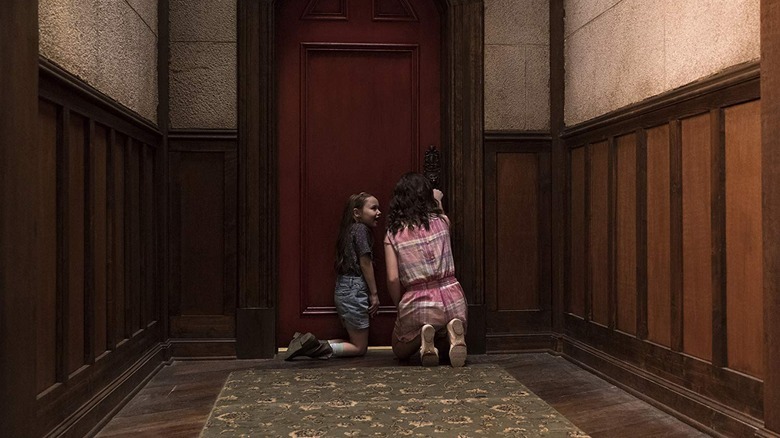 The Haunting of Hill House also contains some significant winks to other pieces of pop culture history throughout the series, including a shot of Nell reading a book by Shirley Jackson, a glimpse at the mirror from Flanagan's Oculus, and Luke with a lunchbox that has E.T. : The Extra-Terrestrial on it, as a nod to Henry Thomas' early role as Elliott in the film. 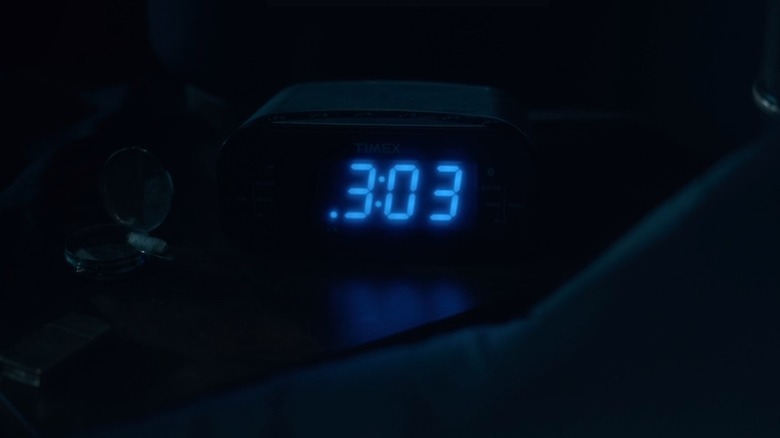 Perhaps the most consequential reference is to the time of 3:03AM, which is when the siblings all startle awake clutching their necks — even if it's still 12:03AM Pacific time, where Luke and Steven live — which also turns out to be the time when both Olivia and Nell died. For Flanagan, the choice of that time was meant to be a wink to a specific trope of the genre. He told EW, "Depending on which urban legend you go with, it's the witching hour. It's one of those times that pops up in different iterations in horror fiction, and we liked it for that." The final twist of the series was that the so-called "Red Room" had actually been open and in use all series long, transforming itself to fit the individual needs of its occupant. For Olivia, it was a reading room; for Steven, it was a TV room; Shirley used it as a sitting room; Theo experienced it as a dance studio; and Nell considered it a toy room. Though the revelation came as a surprise, there were hints of it all throughout the narrative, not the least of which is the singular design of the window that backdropped all of these rooms. In one bit of dialogue, for example, Olivia asks Steven where Luke is, and she thinks he's kidding when he asks if she's checked the treehouse. In another, Nell tells Mrs. Dudley she found the tea set in the toy room, which leaves her very confused. There are several other examples of these exchanges that might slip under the radar on a first run-through of the show. Shirley also later startles awake and mentions "dancing in the Red Room," which mirrors her later muttering of "Nelly is in the Red Room" shortly after her sister's death. 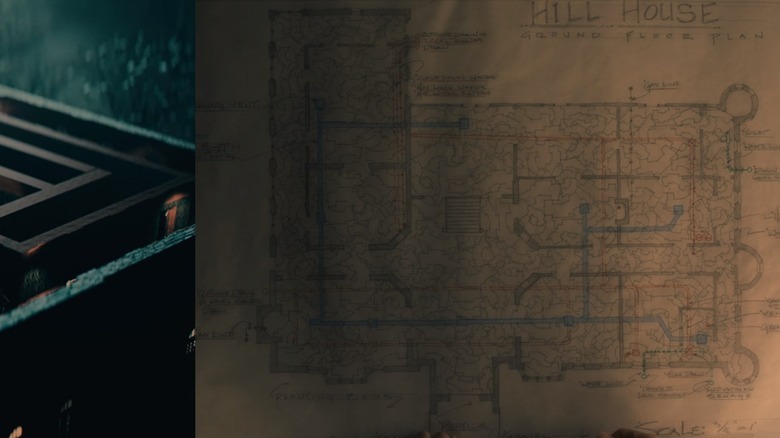 One major giveaway is the set of blueprints Olivia draws of the house, which makes it look like one giant, elaborate puzzle with thousands of tiny pieces. That image also echoes the intro artwork which shows a puzzle in motion, with a Red Room flickering into view in several spots. On top of the Red Room, the importance of the number seven, and the use of time to tie everything together, the series also featured a number of other moments that will stick out as significant upon review. For one thing, the drawing that Luke makes in his "treehouse" of a gaping-mouthed woman might've seemed simply strange at first, but putting it next to the image of what Nell would later look like post-mortem, it's clear where he got the inspiration. The "twin thing" also proved to be very real when he started going cold after Nellie's death, just as she'd experienced the physical symptoms of withdrawal when he entered rehab. Olivia also seemed to predict Nellie's fate when she told Hugh to take down the hanging ropes at the top of the staircase, telling him, "I see an accident waiting to happen if you don't pull those down — bodies swinging back and forth right there." Olivia had also told her children that they were supposed to come inside when the porch light flashed twice as a sign that it was time for bed, and, indeed, when Nellie is beckoned into the house for a final time, that's exactly the signal that draws her in.